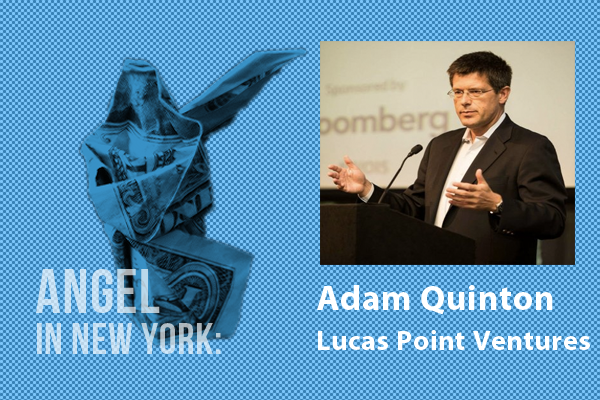 Adam Quinton is Founder/CEO of Lucas Point Ventures and an active investor in and advisor to early stage companies. His investments include The Muse, Rapt Media, VenueBook and Snaps. He recently served as Chief Financial Officer of NYC based cybersecurity company, Nopsec, another one of his investments. Quinton is a Board member at Thrive Metrics. He serves on the Advisory Boards of executive search firm RSR Partners, and San Francisco-based SwoopTalent. He is a member of and/or advisor to several angel groups, including Astia Angel where he is a founding Angel and sits on the Astia Global Advisory Board. Astia is a San Francisco based organization which supports high growth women led companies in the US and abroad. In the not-for-profit space, Quinton is on the Board at International House New York, and a member of the Executive Committee. He is also a Board member at the Center for Talent Innovation. Adam has over 25 years of investing and management experience, most recently at Bank of America Merrill Lynch, where he was most recently Managing Director and head of Global Macro Research. He has been a top ranked sell-side investment analyst in the UK, Asia, and the US. Additionally, he is an Adjunct Professor at Columbia University’s School of International and Public Affairs, where he is a Capstone workshop advisor and member of the Management and Gender & Policy faculties. Quinton holds a MA in Natural Sciences from Cambridge University and an MBA from Cass Business School, London. On exits: “Having a good handle on exits is important of itself, but it also tells me how thoughtful the entrepreneur is about her/his competitive environment. And crucially, who has a product gap that their business might address ie fit in to/add value to. This perspective can and should also drive strategic decisions, too. Simply put, with the M&A exit in mind, startups need to think “acquirer value” not “shareholder value”. ie what maximizes the value of the entity as seen from the perspective of a potential acquirer. In the tech space, the current industry giants have been the dominant M&A players – but increasingly there are opportunities for more creative “non standard” routes to exit.